Discussion in 'ECS' started by Dennis, Aug 2, 2012. CPU VCore voltage consistent with operation of that processor ? is used to turn off the PS_ON# signal sent to the power supply. continue to run, but there'd be no CPU to POST, and a black screen. less guaranteed because it's free in terms of protection, is THERMTRIP. high (because the cooler is no longer making good contact with the CPU). 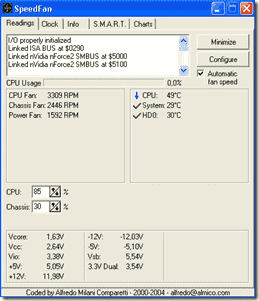 The CPU fan never runs over 1200 RPM and as low as 500 RPM at times. 1) Enter the BIOS and disable fan speed control. and the fan should run full speed. to spin at a minimum speed. This is an example of the four pin (PWM controlled) CPU fans. a four pin fan, the speed should be adjustable by the motherboard. 3) Depending on the cooler design, you may be able to use a "case fan"
on that, doesn't make a lot of noise. No need for speed control at all. The copper trace that powers fans on the motherboard, is not fuse protected. to the CPU fan header. But that is a technique for "taking control"
and allows the pin and wire to be backed out. I replaced the whole CPU cooler and the fan RPM went up to 3120 RPM. found numerous complaints on the original fan only lasting 6-7 months.